Plus tax & applicable materials charge. Most cars. With coupon. Filter may be extra. Joe’s Auto is backed by two nationally known organizations. Both groups have the highest standards in the automotive industry. AAA’s approved auto repair program assists members by identifying automotive repair facilities that meet the association’s stringent criteria for customer satisfaction, equipment, and training. NAPA Auto Parts was founded in 1925 to meet America’s growing demand for world class auto parts. NAPA Autocare is designed with today’s consumers in mind. NAPA knows that a primary concern by many consumers is to find a reputable repair business that performs quality work at a fair price. NAPA Autocare is not a franchise, but rather, a quality standard where independent repair business owners are invited to join based on their reputation, integrity, qualifications, and expertise. We have to employ ASE certified technicians, follow strict guidelines, and be inspected on a regular basis just to be in either of these programs. 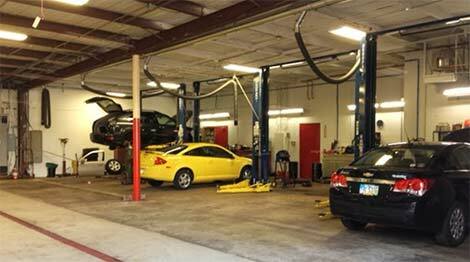 We not only have technicians that are certified in one or two areas of auto repair, they are master certified. They hold certifications in advanced engine performance. Our shop and technicians are E-Check Certified to do all E-Check diagnostics and repair. It takes a lot of work and on going training to keep these certifications, so anyone who has them is in the top of their field. Automotive service excellence (A.S.E.) is the organization who test and awards these certs. These certs. Are proof that our techs know what they are doing. Ask to see them and anyone who has them will be proud to show them. If they don’t have them you may not be getting the top notch service you deserve. All work at Joe’s Auto is backed by at least a 12 month or 12,000 mile nationwide warranty. The warranty is good at over 12,000 NAPA Autocare’s across the country. Joe’s Auto also performs 24 hour towing and road service. We received the ACE Award for customer service excellence. We were nominated for the award from several major motor clubs. As an ACE recipient, Joe’s Auto was ranked in the top 1% of the service providers nationwide. Anyone who has seen a Joe’s Auto truck knows we take a lot of pride in what we do. You cannot provide high quality service, if your employees and equipment do not show that commitment. Ask to see the credentials of the service facility you take your vehicle to. If they don’t have any, or are reluctant to show them, then you may not be receiving the service you deserve. Anyone can work on your car and boast that they’re an expert, but can they prove it and back it with a nationwide warranty? Are their technicians master certified in all areas of auto service? If two highly respected organizations like AAA and NAPA Auto Parts trust Joe’s Auto to use their name, Can’t You?